After more than a month of Syrian and Russian bombardment that has claimed 1,700 lives, the residents of eastern Ghouta have three stark choices: (1) evacuate north with rebel fighters to Idlib province; (2) fall under government control in camps near Damascus; or (3) stay in the last opposition island of Douma, waiting for inevitable defeat. BASEL—Three weeks ago, Amer Zeidan saw no way out of eastern Ghouta but death. His grim forecast proved true for his sister, Marwa, whom he buried last week. Barely a week after reporting this loss, Mr. Zeidan made the decision to leave. Between 3 and 7 a.m. on Tuesday, the Syrian aid worker types away at a new batch of messages documenting the start of a long-dreaded journey out of his neighborhood, Arbeen. After more than a month of Syrian government and Russian bombardment that has claimed 1,700 lives and seen the loss of 90 percent of the last rebel enclave in the suburbs east of Damascus, the residents of eastern Ghouta have only three stark choices. As the noose tightens, they can either be evacuated (with defeated rebel fighters) to Syria’s rebel-held northern province of Idlib, which will almost certainly be the next regime target; or fall under government control in camps closer to Damascus; or stay in the ever-shriveling last opposition island of Douma, waiting for the results of an inevitable defeat. While changes on the battlefield are now forcing decisions like never before, for most the carnage has been so severe that it is premature to talk of peace and reconciliation. The Monitor heard voices from inside the enclave, who in recent days explained why they chose each one of those options, and the forces at play in their decision making. Despite an ensuing UN Security Council cease-fire, declared Feb. 24, relentless bombing and military advances translated into a civilian exodus and agreements to remove the anti-regime fighters who have controlled the largely Sunni enclave since 2012. The evacuations started last week and gained momentum, with more than 101 buses leaving early Tuesday for Syrian rebel-held territory near the border with Turkey. Zeidan describes his fellow passengers as civilians: activists, humanitarians, and rescue workers known as the White Helmets. All felt they would not be safe or at ease living in an area controlled by the Syrian regime. Other buses transported fighters and their families. The mass departures are the outcome of talks with Russia, trusted marginally more than the Damascus regime, although it has provided essential firepower to keep the government of President Bashar al-Assad in place and itself has contributed to breaches of cease-fire agreements. Critics call the mass departures a forced displacement and warn that such evacuations could amount to war crimes. For many observers, the script from siege to surrender has become chillingly familiar and borderline formulaic. This latest exodus is part of a long sequence of rebel capitulations masked as local cease-fires. They ultimately bolster the Russian and Iran-backed Assad regime at the expense of an armed opposition that enjoyed enough foreign backing to keep the fight alive but not win. Pro-Assad forces now control more than 90 percent of eastern Ghouta. The Damascus suburb served as a launching pad for rebel attacks on the Syrian capital. It also endured more than five years of air-strikes, chemical attacks, shelling, and siege that killed thousands of people and left vast areas in rubble. Civilians stuck in the middle have paid the highest price. “Assad and his allies have used local cease-fires, de-escalation zones and freeze zones to increase civilian suffering, perpetrate demographic re-engineering, and advance militarily,” wrote Mohammed Alaa Ghanem in an analysis for Chatham House this month, describing the “bogus” cease-fires as integral to Assad’s military strategy. One of the major Syrian rebel groups in the area, Failak al-Rahman, an Islamist group that has taken part in UN-sponsored peace talks in Geneva, agreed to evacuate last Friday. Its fighters have been boarding the buses of defeat ever since. Abu Akram, a brigade commander who was fighting in the town of Zamalka and gives only his nom de guerre, describes talks with the Russians as little more than a one-way street. Russian and Syrian forces launched a full-scale assault on eastern Ghouta Feb. 18, dividing and defeating one rebel pocket after the other despite the UN cease-fire. The campaign was so intense it reduced residential areas to rubble and pushed the population into basements for weeks on end to survive. The journey out has been traumatic and humiliating for many. As part of the deal, thousands of Syrian opposition fighters and their families, as well as civilians, have been heading to Idlib, a province in the north and the largest remaining area outside government control. Abu Akram says the buses to Idlib drove through the pro-Assad Alawite heartland along the coast, giving an opportunity to regime supporters to curse the vanquished fighters. The commander says he joined the revolution early, defecting from the army after his younger brother was killed by a stray bullet fired from a regime checkpoint. He believes the best option for his own future is to find work, make money, and pay a smuggler fee to leave Syria and cross into Turkey. He fears Idlib, the main recipient of various vanquished elements of the Syrian armed opposition, will suffer a fate as brutal or worse than eastern Ghouta. Others have fled to government-held territory by the thousands, making use of humanitarian corridors. Among them are Noor and Nemaat, civilian women from the neighborhoods of Douma and Sabqa, respectively, who have spoken to the Monitor regularly throughout their ordeal. Reflecting the climate of fear synonymous with the Syrian regime even before the war, both shunned communications for days after their arrival and felt ill at ease to report much beyond their immediate survival. Her decision to leave had been largely shaped by a sense of responsibility for her father, who needed medical treatment, and her toddler and unborn child. However, on the day of departure, Noor was separated from the men in her family and she has had no news of them since. A video circulating on YouTube showed a Syrian government minister handing out water to thirsty crowds only after they chanted pro-regime slogans. 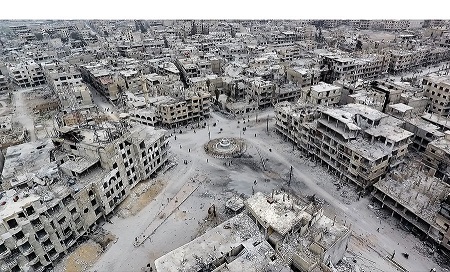 Other images on social media appeared to show Syrian soldiers taking selfies with the vanquished population, crowds of thin veiled women and children in the background. Only one pocket in eastern Ghouta remains now outside of government control. Talks are underway with the Islamist rebel group Jaish al-Islam. A spokesman for the group, Hamza Bayraqdar, says the rebels are talking about staying put in Douma, not evacuating. Syrian troop movements suggest a fresh onslaught is in the cards in the absence of a deal. Civilians who outlasted the siege want nothing more but to stay put, but say no one is consulting them. “The most important thing for me is to not leave my Ghouta,” says Douma resident Samira, who spoke to the Monitor over many weeks. She describes a horrifying day of bombardment in which taking advantage of an unusually calm morning to take out her 9-months-pregnant daughter for a walk ended with both of them running for their lives through rubble and into a basement. Surrounded by death, she prays for a smooth delivery of her now overdue grandson. Young aid worker Alaa Abu Zeid in Douma fields questions from his mother and friends all day long about what to do next. He doesn’t know whether they should try to leave for Idlib like his fighter brother or stay put. To avoid overthinking, he throws himself into online English lessons at night. Photo: Unmanned aerial vehicle photo of Arbeen, eastern Ghouta, 27 March 2018. Source: Ammar al Bushy/Anadolu Agency/Getty Images. How well do you understand the conflict in Syria? Take our quiz.